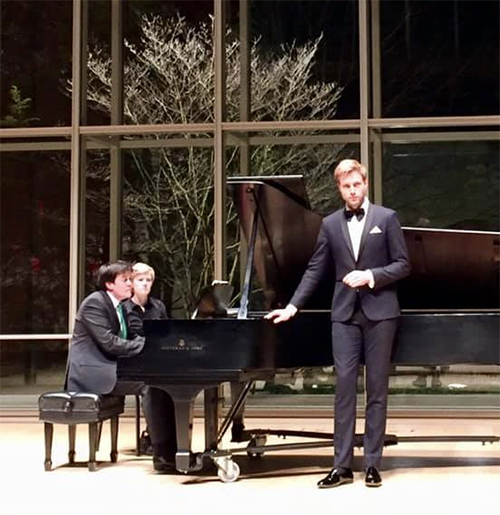 In a Cleveland Art Song Festival gap year recital on January 18, Benjamin Appl and James Baillieu proved to a large audience in Mixon Hall at the Cleveland Institute of Music how utterly compelling a solo song recital can be. 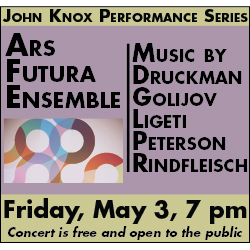 The German baritone and South African-born pianist, both in their mid-30s and making their first U.S. tour, brought new vibrancy to familiar works by Schubert, Schumann, and Duparc, and introduced striking songs by Nico Muhly and Edvard Grieg that were likely new to many. 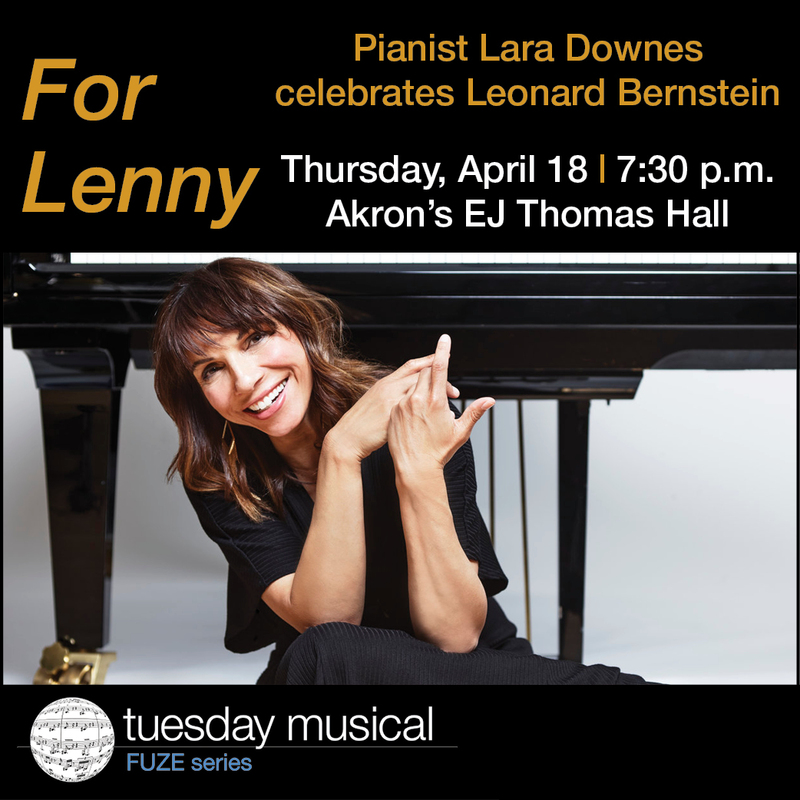 It was clear from the first notes of Schubert’s Der Atlas that a powerful musical tempest was about to blow into Mixon Hall (as well as the real one into Northeast Ohio). Baillieu’s opening gesture was explosive, and Appl matched him with an intense proclamation of the Titan’s misery in bearing a world of pain on his shoulders. 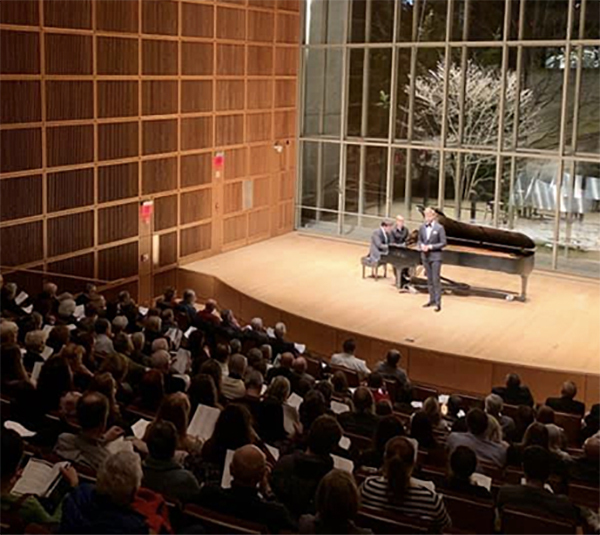 Storms of the emotional sort were obliquely mentioned in Schubert’s Das Fischermädchen, which otherwise provided a moment of calm before the duo’s chilling presentation of Der Doppelgänger. Here, time stopped in its tracks while Appl chanted the poet’s chagrin at seeing his tormented, ghostly double outside the house of his former lover, a vision underscored by Baillieu’s carefully calculated silences. 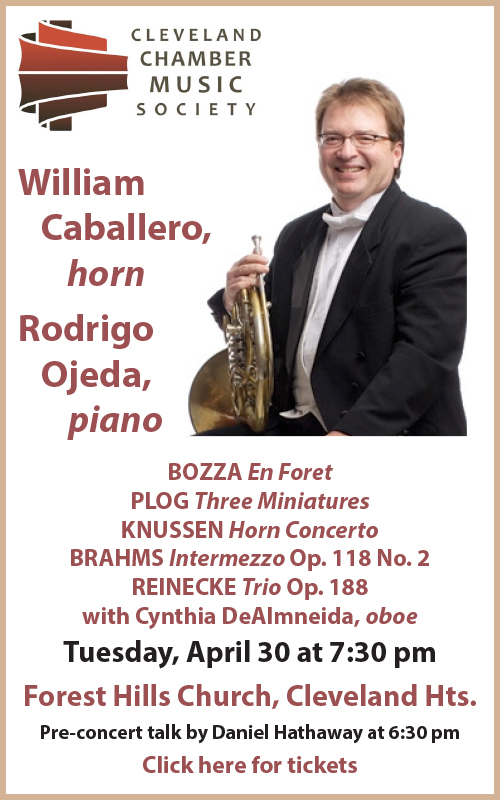 That trio of individual songs introduced the first half of the recital, comprising settings of the often satirical, often ironic poetry of Heinrich Heine. The rest of that segment was devoted to Schumann’s great song cycle Dichterliebe (“A Poet’s Love”). 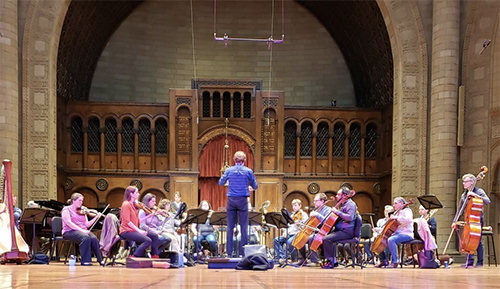 Having seized the attention of the audience, Appl and Baillieu held their listeners firmly by the lapels as they worked their way through its sixteen songs, expertly crafting connections and pauses between pieces that either moved the cycle along or gave a moment here and there for reflection. 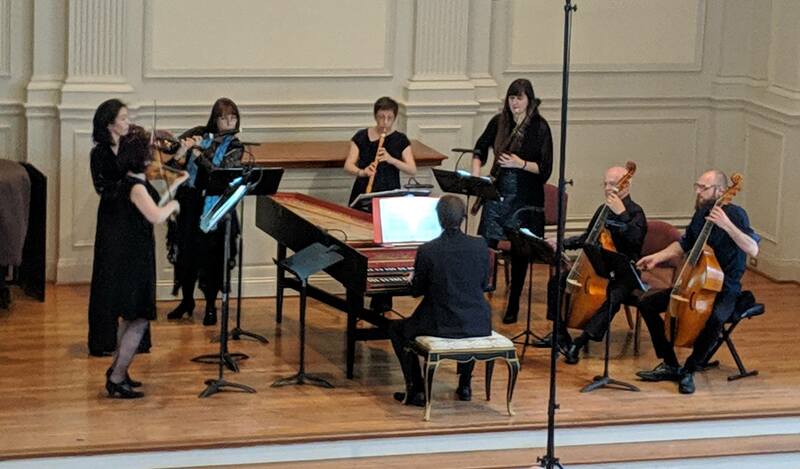 Appl’s delivery of texts was as hyper-expressive as Baillieu’s keyboard articulations, but if you only heard a recording of the two, you’d miss out on half the power of their performance. Benjamin Appl sings with his eyes as much as with his attractive voice, and James Baillieu’s physicality at the keyboard only enhances the sound he produces from the strings. Fully as important as Baillieu’s attacks are his eloquent releases: at one point, he held out a single note, slowly withdrawing his finger from back to front of the key until the tone died away. Highlights of Dichterliebe were too many to list, but included a stunningly fast Die Rose, die Lilie, die Taube, die Sonne where the rhymes of Kleine, Feine, Reine and Eine clicked in a new way; a particularly creepy take on seeing the beloved’s eyes, lips, and cheeks in a painting of the Virgin (Im Rhein, im heiligen Strome); an intensely sarcastic Ich grolle nicht in which Appl seemed to be directing scorn at the entire audience; a wonderfully tossed-off Ein Jüngling liebt ein Mädchen; and the final burial at sea of the poet’s pain in a hyperbolically monumental coffin (Die alten, bösen Lieder). Baillieu usually had the last word in his elegantly-sculpted playing of Schumann’s innovative postludes. 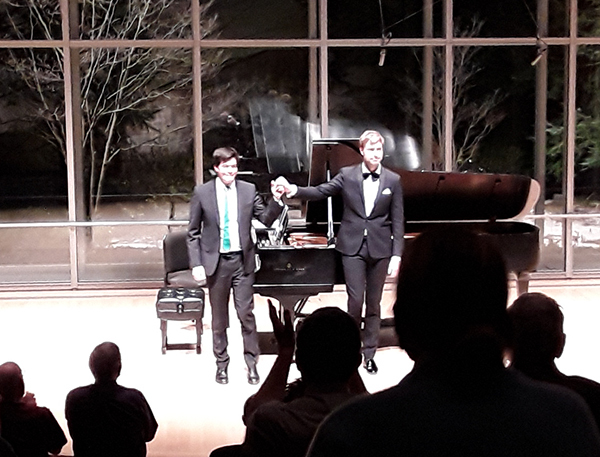 Three beautifully-shaped performances of Henri Duparc songs gave Appl and Baillieu a change in style and texture at the top of the second half. Then came a set commissioned by Appl for a European tour under the auspices of ECHO, the European Concert Hall Organisation. Nico Muhly’s four settings of letters traded during the Great War — plus a Schiller poem — brought wry humor, pathos, and irony to the playlist. In “One,” a soldier writes a Christmas greeting to a sweetheart whose name he can’t remember. In “Two,” a rhythmically frantic scherzo, a woman writes disjointedly to Jack. “Three” chronicles the amusing request by a wife to the leader of a company to release her husband briefly so she can enjoy marital conjugation after four months of absence. In “Four” — just the kind of letter you don’t want to read in your foxhole — a wife writes to her husband that she’s about to put the children in an orphanage and marry another man. Schiller’s “Five” wishes for the return of springtime, which only lives in the magic world of song. 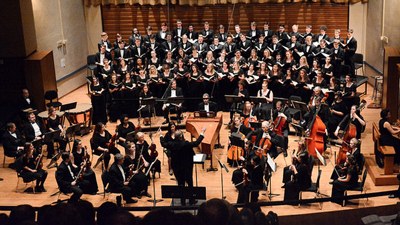 Singing from a score, Appl joined Baillieu in putting these diverse sentiments across with great style. Grieg songs? Yes, there are many of them, but they only infrequently make it to the concert stage. 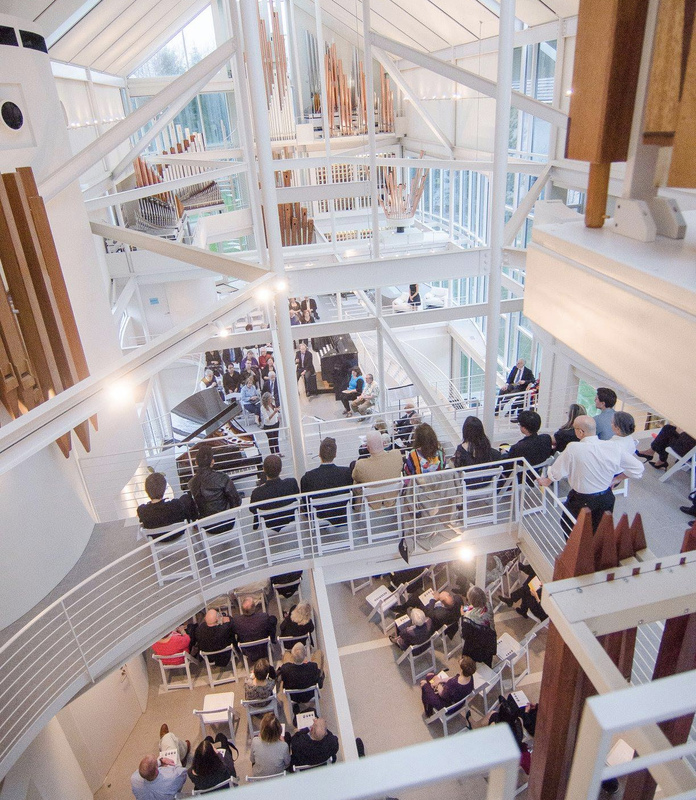 James Baillieu introduced the six pieces that ended Friday’s program by noting that unlike other composers of art song, Grieg was a happy person who lived in a beautiful house and wrote love songs where everything came out well in the end. Highlights included the setting of Walther von der Vogelweide’s charming Die verschwiegene Nachtigall — where the nightingale won’t tell what it saw in the meadow — and Ein Traum, where the narrator has a beautiful dream, wakes up, and finds that it has all come true. Those were a lovely way to end the evening, but the enthusiastic audience persuaded Appl and Baillieu to stick around for two more songs. The first was one of Grieg’s Norwegian songs from Op. 58, the second, Schubert’s Die Musensohn, with its apt references to “roaming through field and wood, piping along my little song” even through the icy realm of winter. 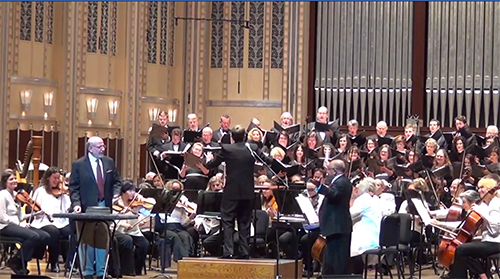 Published on ClevelandClassical.com January 22, 2019.